Eight months before the state election you can already see politicians jumping up and down about law and order to boost their ratings. Peter Dutton has been saying this week that it is the Premier’s fault if Victorians don’t feel safe in their homes. There are always votes to be gained by promising to come down harder on crime. We don’t have to look to far to see why. All of us fear crime to some extent, and it is not hard to fuel a fear, especially if there are votes to be gained. These politicians know that if you can convince people that crime is a growing problem and that you’ll do something about it, they’ll vote for you. The truth is that most crime statistics in Melbourne have been fairly stable for a number of years, but if you’ve been watching the news, that may come as a surprise. In the USA you hear this far more loudly, because conservative Christians make up a much bigger percentage of the population there. They lobby to have the Ten Commandments displayed in law courts and taught in schools. I’m fairly sceptical about the value of such an approach to the commandments. Trying to turn them into a set of universal principles ends up domesticating them and watering them down into a set of bland motherhood statements. So are we Christians supposed to be law and order people, or aren’t we? Well, to give you the summary before I elaborate, it is necessary for a society to have a system of law, but the law will never actually solve the problem that it is seeking to address, and since Jesus has shown us how we can deal with the real problem, our gospel is not a message of law and order. Now at one level, what you have got here is a neat summary of the law and order agenda. If we could just stop people killing each other, jumping into bed with each other’s lovers, stealing each others stuff, and telling malicious lies about each other, then things would be okay, so let’s legislate and enforce the law. But the trouble is, legislating doesn’t stop people wanting to do those things. All it does is restrain most of them, most of the time, and thereby contain the violence and stop it all getting too out of hand. This is where the final commandment is both remarkable and completely impossible. “You shall not desire things that belong to other people. You shall not desire your neighbour’s house, or your neighbour’s lover, or employees or assets or anything else that belongs to your neighbour.” It is one thing to say don’t steal stuff, but it is quite another to say don’t even desire it, don’t even wish you could have it. Now clearly we are not talking about a commandment that can be translated into enforceable law here. We are not going to lock people up for wishing they owned someone else’s house or were married to someone else’s spouse. So what sort of commandment is this? 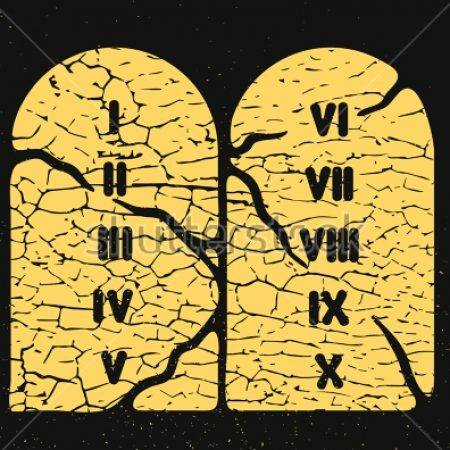 Why do the Ten Commandments have to finish on such an extreme and impossible note? But we are different. Almost all of our desires are learned by unconsciously observing and copying what other people desire. We are eating a perfectly good sandwich, and someone else laughs at our sandwich and pulls out a pie, and next thing we know we are desperately keen to have a pie. Or on the other hand, if the other person walks in and says, “Gee, I wish I had a sandwich like yours,” the next thing we know is that our sandwich suddenly tastes a whole lot better! Now this is universal and unavoidable. Desire is contagious. We recognise the value of things when we see that other people desire them. We learn our desires by unconsciously imitating other people in what they desire. This is intrinsic to what it is to be human. We can’t change it, we can only manage it. And what the tenth commandment is pointing to is the need to manage it, to contain it. In itself, there is nothing wrong with learning to desire by imitation, but it does have a significant down side that needs to be contained. When we learn to desire by imitating, we soon find that we are desiring the same thing as some other people, and that turns us into rivals. Two women who are rivals in their shared desire for the one man do not usually become admirers of each other’s strengths and virtues. Two men who are rivals in their desire for the top job do not usually end up supporting and affirming one another. Just look at the current state of politics! So in fact the final commandment with its prohibition of desire is getting to the root of the issue in the previous four commandments. If it were possible for us to stop desiring what other people have, then the other commandments would be superfluous because we would have no inclination to turn against each other and malign one another, and steal one another’s stuff, and target one another’s lovers, and when it all gets completely out of hand, kill each other. But of course, we are human beings, and it is not possible to just stop desiring what others desire and acquire. And so we need laws to make sure the consequences don’t get out of hand. We need the threat of legally sanctioned violence to act as a deterrent, so that the desire to remain alive and free will outweigh the desire to act treacherously to obtain what others have beaten us to. And many people seem to think that therein lies the whole of the gospel. Enforce adherence to the Ten Commandments, and all will be well. But surely the commandments themselves are telling us that all will not be well; that the law may keep the problem from getting right out of control, but it can never overcome it. The law may keep most of us in check most of the time, but it doesn’t deal with the roots of the problem, and we are still stuck wishing that we were more like other people and could have what they have and resenting them for getting ahead of us. The gospel of our Lord Jesus the Messiah is not just an improved way of containing the problem. The gospel of Christ is about complete salvation from the problem. It takes seriously the problem witnessed to in the commandments, and especially in the last one, and approaches the problem in a quite different way, a way which does not overturn the law, but which fulfils it and ultimately renders it redundant. Jesus responds by acknowledging that we learn to desire by imitation and giving us a new and life-giving pattern to imitate. Jesus calls us to imitate him in his imitation of his heavenly Father. For if we truly imitate Jesus in his imitation of the Father, there is nothing there to turn us into rivals of one another. What we will be imitating is love and mercy and self-giving. “Be like your Father in heaven who sends down his rain on the evil and the good alike.” If we could achieve such singleness of desire for God and God alone, for love and love alone, then we would be saved and the world would be healed. Our gospel reading spoke of the zeal of Jesus; his passionate desire. In his single minded desire for the Kingdom of God, he could not stand to see the worship of greed taking place in the temple itself. But also in the gospel reading we heard Jesus’s outrageously bold claim about the radical change that was taking place through his life and ministry. Tear down the temple, and I will build it up again in three days, and we are told by the narrator that he was referring to his own resurrection. Tear down the temple – this great symbol of the old system, of the law and the bloody sacrifices demanded when our rivalrous desires get out of hand. Tear down the temple, and I myself will rise up as its replacement. What an astonishing claim. And yet he has followed through on that claim. He maintained his perfect imitation of the Father even when our need to sacrifice another victim in our futile struggle to contain our own hostility turned on him and called him a threat to our law and order. He maintained that perfect imitation all the way to a tortured death on the cross, and then rose three days later still consumed with a passion, not for vengeance, but for the love and extravagant forgiveness that he learned in imitating the Father. And knowing that we could not quit imitating one another and turn our attention to God without our old selves being snuffed out, he calls us to follow him and be immersed into his death in the waters of baptism, so that we might rise with him to new life, freed and forgiven and being transformed into the likeness of the Father. Law and Order? Well, gathered up into the love and mercy of the crucified Christ, there is no longer the need for prohibitions for those who live in imitation of Christ. The whole law, which Moses managed to summarise down to ten prohibitions, is now fulfilled in two positives. Love the Lord your God with your whole being, and love your neighbour as yourself. When we rise to life with Christ, and love God and one another in imitation of his love for us, law and order will take care of itself and desire will lead us only into love and no longer into rivalry. May the desire of Christ consume us, to the glory of God and for the salvation of the world. Amen.